Check out this beautiful Bead Leno Scarf designed by Deanna Deeds! 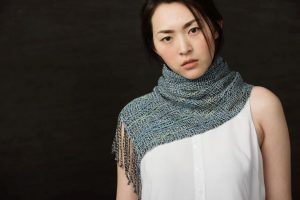 The 4-shaft pattern uses Zephyr Wool Silk, Super Lamb Merino, and Kokadjo yarns all from Jagger Spun! 2/24 Super Lamb Mallard – ¼ cone 1490 yds. 2/18 Zephyr Wool Silk Pewter – 25g 280 yds. 2/18 Zephyr Wool Silk Aegean Blue – 25g 280 yds. 4/14 Kokadjo Riverwalk – 25g 108 yds. 2/18 Zephyr Wool Silk Apricot – 25g 280 yds. Questions? Interested in ordering a kit? Please complete the form below.